• Follow the rules and regulations of WHA. • Keep the unit clean and in a safe condition, including appliances. • Keep entrances of the apartment free of trash, snow, and ice. • Notify the WHA of any and all repairs needed. • Pay charges for the repairs and damages to your apartment. • Cooperate with WHA staff. • Not store flammable materials in your unit. You also agree that any criminal or other type of activity that threatens the health, safety, or right to peaceful enjoyment of the premises by other residents, guests, or WHA employees is cause for possible termination of your lease. • Take in boarders, sublease unit, or allow others to use your address for mailing purposes. • Disturb your neighbors or create situations that affect your health and safety or that of your guests, neighbors or WHA staff. • Disturb other residents’ enjoyment of the property. • Speak in an abusive, threatening or discriminatory manner towards neighbors or staff. • Display, use or posses firearms, including BB guns, paint guns, or other offensive weapons. • Hang satellite dishes, radio or television antennas on or from any part of the unit. • Install electric fixtures without written authorization. – Moving time must be between the hours of 8:00 AM and 4:30 PM by a BONDED mover only. (A listing of local movers will be provided). This is for furniture only. – You may move anything that fits in your automobile at any time, nights and weekends. – You must notify the Manager’s office as to the day and time your move will take place at which time we will have the elevator padded and reserved for you. – Move out time is the same as move in which is Monday through Friday between the hours of 8:00 and 4:30. Furniture only. – You must notify office as to the date and time of move so we can pad the elevator. – Once apartment is vacant, you may either drop the all the keys, tags and laundry cards in the Manager’s rent slot or you may bring to the Manager’s office located at Kennedy Manor. The Manager will then inspect the vacant unit and if a refund is due, will be mailed within 10 working days. Do not remove the butter dish, the ice cube trays or TV amplifier/cable from the apartment. Notify the WHA immediately if your unit is in need of repairs. Call a work order in at 767-8000. Do not attempt to make repairs yourself. When you call, you will be asked for your name, address, any household pets and a brief description of the maintenance problem. You will also be asked whether you will allow maintenance personnel to enter your apartment if you are not at home. No appointments are made for repairs. The resident is responsible for all maintenance charges for repairs above and beyond routine wear and tear. In some instances, residents may be charged for the cost of labor. The WHA has a strict policy regarding pets. Certain pets are allowed in the units, as long as the owner follows all rules. Before you decide to own a pet, please read the pet policy. Service animals are always accepted. Any resident adversely affected by a WHA action or failure to act has the right to call for a review. The WHA grievance procedure has two levels: an informal management review and formal hearing before a grievance panel. The resident must initiate the grievance procedure by submitting a signed, written request with the management office. If you wish to file a complaint against another resident or a WHA staff member, please download a Complaint Form or obtain a copy from the Manager or Resident Service Coordinator. Fill out the complaint form and drop it in your Manager’s rent slot. Complaints will only be taken in writing. No telephone calls. The Manager may call in both parties or may opt to call in one party to try to resolve the issue. If a medical issue is involved, the manager may call in the resident’s sponsor. If the issue cannot be resolved and it is a nuisance and disturbance problem, which is a violation of the lease, the file may then be brought to the legal department for further action. In the residences of Kennedy Manor, St. Germain Manor, Parkview Manor and Crepeau Court, there are many activities that residents can participate in. 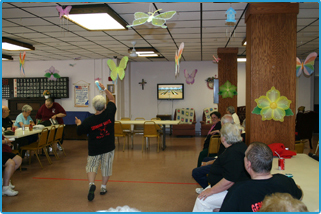 Some of the activities are: Wii bowling; bingo; aerobics and exercise classes. These residences also have computer rooms as well as on-site meals served in each community room. Social clubs also organize various activities. Our family residences of Morin Heights and Veterans Memorial offer various activities for its residents. Each offers an after school tutoring program as well as computer rooms for use during scheduled training times. Both family sites schedule various group activities for the residents.